The poet David Whyte tells a wonderful, albeit painful, story about himself. He was busy at work, running from one office to the next. He passed a conference room full of his colleagues who were about to start a meeting. He knew there was someone he needed to talk to, but he saw immediately that this person wasn’t among them. He put his head in the door before they could begin and in a very loud, urgent voice, said, “Has anyone seen David?” The group paused, and then quickly broke out in laughter. I looked back at them blankly, the truth dawning as I looked. ‘Has anyone seen David’ might seem an innocuous question in most organizations, but I happened to be the only David who worked under that particular roof. I realized the forlorn and public stupidity of my request and forced myself, after a wide-eyed moment, to laugh with them. Inside, I was dying. I laugh at David Whyte’s story, but in an uncomfortable, ‘that is hitting a little close to the bone’ kind of way. So many of us are moving so quickly, hustling through our days. Any time for reflection feels as if it is a luxury, something we do if a space opens up in our day. But it is not a luxury. And research is beginning to help make the point. 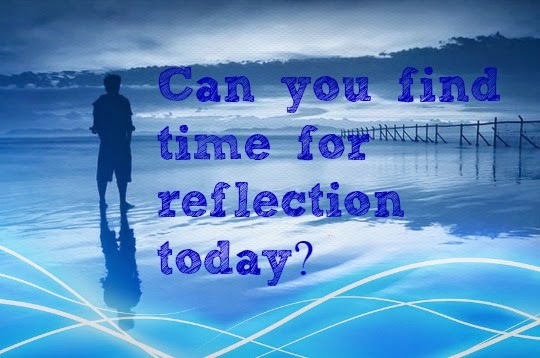 Most recently, Francesca Gino at Harvard Business School has been doing research on the importance of reflection. In one study she found that employees who spent 15 minutes at the end of each day reflecting on what they learned were 22% more productive than those who did not take the time to reflect. All they did was think about their day, and try to synthesize or extract learning’s. Reflection is a necessity for the human spirit, like food or oxygen for our bodies. Can you find time for it today? It’s been a month since my Mom died, and while I cling to the hope of the resurrection of her life with God, the angels and saints, including my wonderful dad, today, I’m still sad. Sad that she’s gone from us, sad that she never met her namesake grandson, Dean, who was born just a few weeks after she died, sad that she struggled to cling to life fiercely robbing her of a peaceful death, and sadder still that I couldn’t figure out better ways for her to spend the last years of her life with us! I hate the blindness, arthritis, the congestive heart failure, the aortic stenosis and all the related disease that created the separation between her and our family here in Chicago. I so wish she could have been “around” the last 2 – 3 years to experience her grandchildren and great grandchildren. She would have loved them so much, and they would have loved her right back. I hope she forgives me to whatever extent necessary for not finding ways to make that happen. I tried, but today I’m feeling not hard enough. It’s not that I failed to spend enough time with her – I did that! However, in the last 3 - 6 months as her dementia set in and her anxieties, fears, and hatred for what was happening to her deepened, our relationship was severely tested. My patience was pushed to its limit. Many times I was unable to accept or deal with mom’s dementia instead personalizing our exchanges as if it were my mom speaking—only to realize each time after I’d leave that it wasn’t her at all, but instead, the disease. I know that if she were here today, we would both forgive each other and would say we did the best we could. And yet, we’d also say that we know it wasn’t good enough because it fell short of our heart’s desire to share our lives, our joys, our wonderings, in short, to be fully alive and present to ourselves, each other, and to God’s presence within and between us. So even in the middle of grace, there is a reality that, yes, we did the best we could; but, no, it wasn’t what we would have hoped for. It was less—and today that hurts! It saddens me! I wish I had time to tell you all about this wonderful woman who lived her life in pursuit of the God who she always embraced but couldn’t fully comprehend and certainly never “put him in a box” as she often said. The picture above captures her spirit of expectancy, of anticipation, of fun, of leaning into the next part of the conversation and of what’s next. But, at the end, she couldn’t find a way to let go of life as she knew it and as she wanted it to be. She couldn’t embrace her long-held belief that “Today is a Gift” and as a result couldn’t find both God’s presence and peace in those moments. That same stubborn will to hold on to her beliefs, her lifestyle, her God as she understood him, prevented her from having the peace of knowing that she was passing into the fullness of God, eternity, and all that she hoped for. My hope for her is that this has now been conquered—and that she is with God, the saints and angels, and even with her beloved husband Joseph . . . and for me, I hope my sadness over her slow loss of life will soon be replaced by this joy and all the good memories.